As part of TechFestLou, Marwood hosted a Rad Science Skateboard Build at the University of Louisville Engineering Garage on August 19th and 20th. 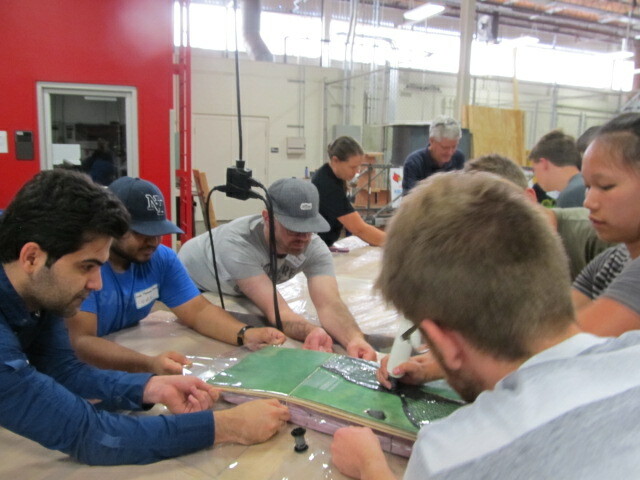 With 17 participants and 5 observers in attendance, students and professors learned STEM (Science, Technology, Engineering, and Math) skills that are necessary to make Skateboards. The creativity behind each of the boards design was not only inspiring, but a hopeful glimpse of what these students will add to our local TECH workforce in the future. Nasser Saadatzi, a U of L Engineering Ph.D. student, was even consulting with us on building a Maple platform Board for a Robotic Nurse that he is prototyping. How cool is that?! A Holy Cross high school teacher also became excited with ideas for her STEAM class. In our skateboard builds, students learn more than manufacturing skills. “Soft skills” like leadership, teamwork, time-management, communication, self-starting, and attention to detail, are also emphasized and practiced in our class. As you see in the photo below, students have to work together during the lamination process of the boards because it is time-limited. It’s always fun to watch which leaders grow and how many different communication styles are evolving in the next generation. Click here to see one of the students practicing on the skateboard he built at the class. Be sure to stay up to date with Marwood on Facebook and Instagram, you don’t want to miss out on exciting events in the future!